Kevin Ramnarine: The last platform at T&T? Offshore platform construction. Fabrication of the EOG Toucan Deck in La Brea, Trinidad. It is likely that Juniper will be the last platform to be fabricated in La Brea. I sincerely hope this is not the case. However, recent events related to this project seem to suggest that we are headed in that direction. Oil and gas production platforms like Juniper can be fabricated faster in the USA and with much less headache. The fabrication of offshore platforms at Labidco in La Brea started in 2003 and was hailed as a victory for local content. Prior to 2003, the platforms that dot the waters around our country were built in fabrication yards along the US Gulf Coast. Bringing this business to La Brea meant that an additional element of the energy value chain was being captured locally. It meant investment, job creation, technology transfer and capacity building. In the period 2003 to 2011 nine platforms were fabricated in the Labidco yard mainly by Tofco. There was a hiatus from 2011 to 2014. 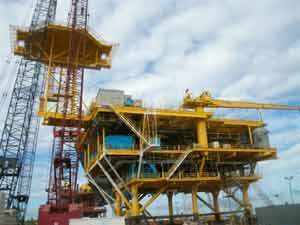 In August 2014 BP approved the Juniper project and the company decided to fabricate the related platform at Labidco. This was good news as it meant that the dormant fabrication yard would return to life. Construction on the Juniper platform started in November 2014. In 2015 and into this year, the project has been dogged by industrial relations issues and work stoppages. These incidents caused the schedule to slip. In the middle of 2015, while I was still the Minister of Energy, a decision was taken to move the fabrication of the platform's jacket to the United States. The jacket is that component of the platform that is underwater. Fabrication of the topside component, however, continued in La Brea. It was explained that target date of “first gas” by the third quarter of 2017 could only be maintained if the fabrication of the jacket was moved to the USA where it would be built faster. The bigger picture dictated that Juniper be operational by the third quarter of 2017 as planned. At its peak production rate the Juniper platform will produce a much needed 590 million standard cubic feet of natural gas per day from the Corallita and Lantana fields. By any measure this is a significant amount of natural gas. It will help with the current shortage of natural gas at Atlantic and Point Lisas. It will not eliminate the shortage but will go some way to easing the pain. In addition, if you understand how real GDP is calculated, the start of production of natural gas from Juniper in itself may mean positive economic growth in 2018 and an end to the recession. On another matter, the country may be unaware that in 2012 there was a deliberate attempt to disrupt the drilling of a major natural gas well by people with a narrow interest. Thankfully a crisis was averted offshore. Interestingly, the same natural gas well went on to find a much-needed one trillion cubic feet of natural gas and has been in production since 2014. Recently I was told of the sabotage of a land-based seismic programme in south eastern Trinidad. Too often with land-based seismic programmes (especially in south east Trinidad) we have stories of equipment being vandalised or stolen and oil company employees being harassed and intimidated. In 2011, during my tenure as Minister of Energy I had cause to bring to the attention of the Minister of National Security a similar situation in the same part of the country. Such acts don't help our image as a destination for investment. We live in a world where we must be competitive in order to attract capital whether it is local capital or foreign capital. The investment dollar is not obliged to come to T&T. Investors have options. Capital flows to where it gets the best return. I sometimes get the feeling that this type of thinking has escaped some in T&T. Too often in T&T the national interest is held hostage by narrow sectoral interest or narrower personal interest. Ease of doing business is critical to a competitive economy. This has been recognised by the World Bank which maintains a ranking. It its 2016 report, the World Bank ranked Singapore as number one in terms of “ease of doing business” out of 189 countries. T&T is ranked 88th and our Caricom peers Jamaica and St Lucia are ranked higher than us at 64th and 77th respectively. Countries like Mexico and Colombia long viewed as “narco states” are making strides at becoming investor-friendly. On the same ranking Mexico is 38th and Colombia is 54th. If you talk to businessmen around T&T they will tell you that it has become more difficult to do business in T&T. It is hoped that good sense prevails in La Brea and at the Labidco fabrication yard. It is also hoped that Juniper will not be the last platform to be fabricated in this country. Indeed the vision ought to be that we should be fabricating at Labidco platforms for Guyana, Suriname and Venezuela. Kevin Ramnarine is a former Energy Minister of Trinidad and Tobago. Petroleumworld does not necessarily share these views. Editor's Note: This commentary was originally published by The Trinidad & Tobago The Guardian, on Tuesday, February 23, 2016.Petroleumworld reprint this article in the interest of our readers. User notice: All comments posted and published on Petroleumworld, do not reflect either for or against the opinion expressed in the comment as an endorsement of Petroleumworld. All comments expressed are private comments and do not necessary reflect the view of this website. All comments are posted and published without liability to Petroleumworld. This site contains copyrighted material the use of which has not always been specifically authorized by the copyright owner. We are making such material available in our efforts to advance understanding of issues of environmental and humanitarian significance. We believe this constitutes a 'fair use' of any such copyrighted material as provided for in section 107 of the US Copyright Law. In accordance with Title 17 U.S.C. Section 107. For more information go to: http://www.law.cornell.edu/uscode/17/107.shtml. All works published by Petroleumworld are in accordance with Title 17 U.S.C. Section 107, this material is distributed without profit to those who have expressed a prior interest in receiving the included information for research and educational purposes.Petroleumworld has no affiliation whatsoever with the originator of this article nor is Petroleumworld endorsed or sponsored by the originator. Petroleumworld encourages persons to reproduce, reprint, or broadcast Petroleumworld articles provided that any such reproduction identify the original source, http://www.petroleumworld.com or else and it is done within the fair use as provided for in section 107 of the US Copyright Law. Copyright© 1999-2016. Petroleumworld or respective author or news agency. All rights reserved. share your thoughts on this article, your feedback is important to us!